The Xbox 360 and the PlayStation 3 share a common release this week. 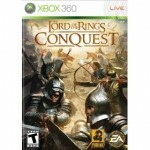 Lord of the Rings: Conquest ships for both systems on Tuesday, January 13th. This week Wii offers Deal or No Deal — released on Tuesday, January 13th. Deal or No Deal shares its game play with that of its TV show predecessor. Players are given 26 briefcases to choose between. They must narrow the cases down one by one and hopefully walk away with big money. Deal or No Deal has not yet been rated by the ESRB.